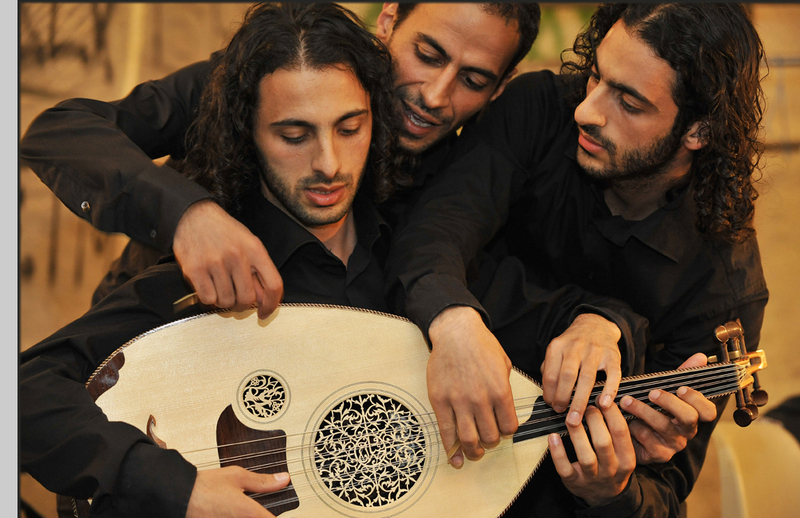 *Le Trio Joubran* is a Palestinian oud ensemble, made up of the three brothers Samir, Wissam and Adnan Joubran all hailing from the city of Nazareth. 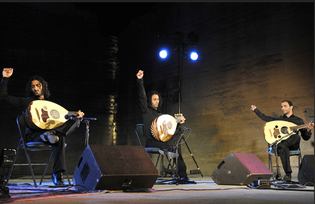 The Joubran brothers come from an artistic family: their father is famed throughout the Arab world as a master stringed instrument maker and their mother, Ibtisam Hanna Joubran, sang the Muwachahats (poems that originated in Arab Spain). Their debut album as a trio was Randana which was followed by Majâz and more recently A l’Ombre des mots, a concert in Ramallah to mark the death of Palestinian poet Mahmoud Darwish. The latest CD is a soundtrack for the film “Le Dernier Vol” which was a collaboration with the trio Chkrrr. Yes, it was a concert by the Mexican guitar duo Rodrigo y Gabriele. We were invited to play with them because their last album 11:11, was inspired by many musicians and one track was inspired by Le Trio Joubran. This is the third time we’ve been invited to play with them at their concerts, and we play for just one or two songs. We have played with them at various concerts in France as well. You are starting your own tour in France and Holland quite soon aren’t you? We have been living in France for the last five years so we play a lot of concerts in France and in Europe generally, but we play more concerts here in France as we started out here. So France is your new home? Yes, that’s right. We are playing concerts all over the place. We are constantly working – we are very busy! You recently made a CD to mark the memorial of the death of the Palestinian poet Mahmoud Darwish. Yes. We have had a long association with Mahmoud Darwish. 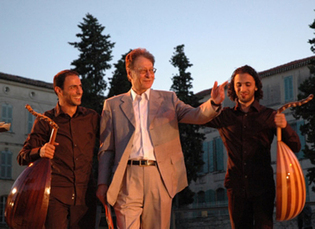 We were the group who performed with Mahmoud Darwish at his poetry readings on many occasions. We had known him and been working with him for 13 years. I just wanted to say something that is very important to me: this project was something that we had already planned to do with him before he died. We had spoken about the project on numerous occasions with him and he gave us the authorisation for it. He said that the only group which could undertake such a project was Le Trio Joubran as we understood him so well after so many years of working together. There was an excellent chemistry between us, we understood each other perfectly. So, the project went ahead after his death? Yes. We feel bad that the project happened after his death. It was a terrible tragedy, he died so suddenly. We spent so much time waiting for the right moment to do the project that we ended up being too late. The voice that you hear on the CD is his voice. We asked him once to come into the studio with us and record his poems, but he said that he did not want to recite his poems in front of machines. He told us to just record his voice during the concerts that we did together, so that is how it happened. His death was a real shock for us, as his last recital was in the south of France and he appeared to be fine and very happy and in good health. But he decided to go ahead with some surgery that he needed and he died a week later – it was terrible. The project took place soon after that? Traditionally a memorial happens forty days after a death so that is how it was. The concert took place in Ramallah and the CD and the DVD were the result. He truly was. Absolutely. He was a very near to the people, a very simple person, he spoke a great deal about nature and about life. Quite simply, he was our idol. He taught us many things – he taught us what life really means. Unfortunately many people think that Palestinians are only interested in death, but this not true. All we are asking is to be like other people and to live normal lives. This is what Darwish was trying to express in his poems: our dream to become just normal people with normal lives. You did a soundtrack recently too. Yes, we did this in collaboration with another group called Chkrrr for the film “Le Dernier Vol”. We were invited by the Director Karim Dridi to write the soundtrack. He liked our music and he knew exactly what he wanted for the film. He didn’t want traditional movie music, with a big orchestra like they have for love stories: he wanted something unique. It was a great honour for us to be asked to do the music for such a major film. It was also something very different from recording an album – with a film you are working to an image. This was a major film project? This is the biggest film project we have been involved in. We travelled to the set to get a feel for the film, to be inspired by the desert and the personality of the actors. It was also very interesting for us to work with the band Chkrrr. It was a mix of two cultures and it is not easy to get it absolutely right but we were very happy with the final result and I am sure they were too. We were combining two musical traditions, Eastern and Western and the target audience of the film was also a factor as it was not meant to be exclusively Middle Eastern but Western too. The chemistry between us and Chkrrr was good and we managed to bridge the Eastern and Western musical traditions while maintaining the integrity of each tradition. What is the history of Le Trio Joubran, how was the trio formed? Samir started as a soloist in Palestine. He made his first two solo albums Taqasim (which means improvisation) and Sou’fahm, but it was after Tamaas (his third album), which we played together on, that the two of us started our international career together. We started out with concerts in Italy, as we both happened to be there at the time and then we did a festival in France and some concerts. Then we found a manager – so things started like that. Adnan joined us at a later date, and we liked the idea of a trio – we were inspired by the Paco De Lucia, Al DiMeola and John Mclaughlin trio with their famous live album, “Friday Night in San Francisco”. The oud is the father of the guitar so there is no reason why we could not do the same thing with the oud. So just three ouds together? It was a real challenge for us. 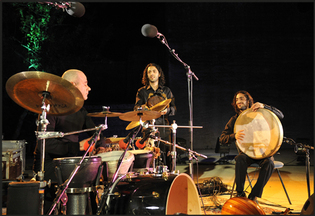 It is the first time three ouds have played alone on stage. It wasn’t easy, but the success we have had comes partly because we are brothers and we understand each other implicitly. Things came together and developed very naturally. I am not sure if this success can be recreated with other musicians, I hope it can. I heard that you played on stage for the first time at the age of twelve supporting your brother Samir. Yes, it’s true. That was in Paris at the Institut du Monde Arabe and that was when I met Mahmoud Darwish for the first time. After he saw us he got thinking and suggested that we come together and mix our music with his poetry. You started by learning the violin, is that right? Yes, but I quickly became more interested in the oud. I am the fourth generation in a family of oud makers. You could say that it was the dream of my father to see one of his sons go to a school or a university to study oud-making. In the Arab world this knowledge is traditionally passed down from father to son. It is important work and a very precise job and it requires special training. At professional schools they research more into acoustics and mathematics, something that is not passed on in the Arab world, so these schools are important. My father once told me that he travelled to Germany to buy special wood to make a violin, but they refused to sell it to him as he did not have a diploma. You went to the Antonio Stradivari Conservatory, in Cremona? Yes and I was very proud to show my diploma to my father at the end of my studies. Initially he didn’t really want me to go to study in Italy and he tried to dissuade me as he knew that it was difficult to make a living from this. Are you still a lute maker as well as a musician? Yes I am both. It is like eating and drinking for me – both are essential! What about the other musicians who play with Le Trio Joubran? There is Youssef Hbeisch who is a wonderful percussionist. We all love Youssef because he is a very sensitive person – he is not just a great musician, he enters into the spirit of our music. He tunes his instruments just the same as we tune ours. Youssef is a very important person for our music. How much of your live shows is improvised? A great deal, about 50% is improvised on stage. This is traditional in Arabic music, we improvise a lot. Also the fact that there are three of us on stage, we speak to each other via the music, we have a dialogue going on between us. Sometimes people ask us, “What were you talking to each other about?!”. Sometimes the dialogue flows when we agree, but other times when we don’t agree we get moody with each other through the music. We improvise with the audience too. It is not just about the musicians. Without the audience we are nothing. We talk to the audience with our music and we thank them for being there. We don’t see the audience but we really feel them, sometimes somebody is crying, or somebody is laughing. Perhaps this is a silly example but one time we were playing in France and we could hear someone in the audience laughing very loudly, almost excessively. We realised that the person was mentally handicapped. This was the second time this had happened to us – and it was the most beautiful concert we have ever given. This person was very, very sensitive and he was really appreciating our music – we were communicating with him from the stage, and after the show he came backstage to meet us. It is difficult to explain but it was a beautiful experience. When you communicate like that, it is real music. We are working on a new album for 2011, but it is too early to talk about it really. What about the instrument itself, the oud? It is a very old instrument, going back 5,000 years. The oud was originally from ancient Iraq, from the Akkadian period. Some people say the oud comes from the pyramids or from Hebrew culture or from the desert, but we are sure now and have evidence that the oud comes from ancient Iraq. Who were your major influences, as oud players? Farid Al Atrach in his time was doing remarkable things with improvisation but perhaps my favourite is Om Kalsoum’s oud player, Mohamed Al Kasabji. We were all strongly influenced by him, even though he was very much a backing musician. He was the one that made her famous with his compositions, but she put a lot of pressure on him to stay in his place. He was a genius – one of the most sensitive musicians ever. He looked very old and traditional but he was very contemporary and radical. Not many people understood this. We also loved Munir Bashir – he was the one who turned the oud into a solo instrument. He had concerts in Europe just playing the oud. He was the first to put the oud centre stage. His brother Gamil Bashir was a great oud player too. What about politics? Your brother Samir is quoted as saying: “We have two battles to fight: one is for our career, and the other is for peace in Palestine, and the end of the occupation”. I imagine you agree. Of course, we cannot separate politics from our lives. All Palestinians just want this terrible situation to end so we can lead normal lives. As for me, I would love just to be a musician and play music. The Palestinian people are greatly misunderstood and misrepresented: all we are asking for is justice. We want our land, to have our houses and to have a normal life so that our children can have a smile on their face. If I want to get married to a Palestinian, I can’t – I am prohibited from doing so, strange as that may seem. If I want to visit Palestine, which is my own country, I can’t. It is very unfair. I am Palestinian and I cannot marry a Palestinian, but you as a foreigner can marry a Palestinian – it is illogical and absurd. I can’t even visit Palestine! My brother Samir cannot live with his wife in Palestine, because they have different passports. They have to live abroad, and they are both Palestinians, it is terrible. I don’t want to go into too much detail, the situation is very complex but through our music we want to explain who Palestinians are. The news that people read about Palestinians is all wrong and distorted. Our culture is related to our land, like all cultures. I think Israelis and Palestinians can live together – we used to live together many years ago. We had a peaceful life. We need peace and justice. We are praying for a peaceful life. Violence is not the solution. I know that some politicians believe violence is the solution – I do not believe that. The recent wars in Gaza and Lebanon solved nothing. The solution is to communicate! But look at the wall that has been built in Palestine, this is pure non-communication. This wall is just a way to cause problems. If you have no communication, you have no peace.